When planning holidays in the countryside we often only consider what we will do with our days, but what about the nights? With our big, open skies you’ll be amazed at the star studded skies as you sit on the decking outside your log cabin in the complete darkness. The Peak District is the perfect place for getting away from the bright city lights giving you an opportunity to view the sky at night in all it’s glory. Over the past 100 years or so, our skies have become more difficult to view as man-made light pollution obscures the stars. However at Hoe Grange we are fortunate to be in one of the dark sky areas of the Peak District. Being so far away from towns and streetlights our night skies are truly dark, and you can still get a brilliant view of the twinkling stars above. On a clear night there is nothing better than lying on the grass, gazing up at the starry sky and soaking in the peace and quiet or even better from the hot tub! If you are into astronomy and have a telescope, why not bring it along on your holiday? Don’t just take our word for it! The Peak District National Park Authority, Nottingham Trent University and the Science and Technology Facilities Council have collaborated to identify dark sky discovery sites where the conditions for stargazing are good. One of the three designated dark sky sites is at Minninglow car park just a couple of miles along the High Peak Trail from Hoe Grange. 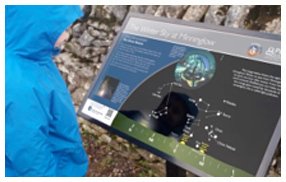 There are three dark sky sites in the Peak District with astronomy interpretation panels to help you explore the night skies. The panels are changed each season. 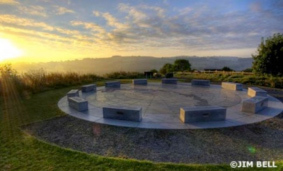 If you are interested in astronomy and stargazing why not visit The Star Disc, situated at the top of Stoney Wood, near Wirksworth. It is a stunning space created by local artist Aidan Shingler to celebrate the wonders of the night sky. The stunning StarDisc spans 12 metres. Carved into black granite is a star chart that mirrors the northern hemisphere’s night sky. The stone circle is inscribed with the constellations, their names, and a depiction of the Milky Way. Contrasting with the dark stone star chart is a perimeter of silver granite with 12 seats which represent the months of the year. Best viewed y night, 72 lights illuminate the StarDisc, powered by our nearest star – the Sun. In close proximity to the StarDisc are six Solar Calendar Stones, positioned by local engineer, Keith Hunter, to show precisely where the sun rises and sets at the solstices and the equinox. Did you switch off for Earth Hour? Talking of dark skies did you show support for WWF Earth Hour on Saturday 30th March? Hundreds of landmarks across the UK switched off their lights as a visual display of their commitment to the future of our planet – The Shard, Piccadilly Circus, Big Ben, London Eye, Buckingham Palace, and Edinburgh Castle to name a few. Growing support for Earth Hour has helped WWF find solutions for the environmental challenges faced the world over. This includes influencing national climate policies, planting new forests in Uganda, and banning plastic in the Galapago. The problem is we think we have time. But for a future where people and nature thrive we need to act now! Make a start by calculating your environmental footprint.